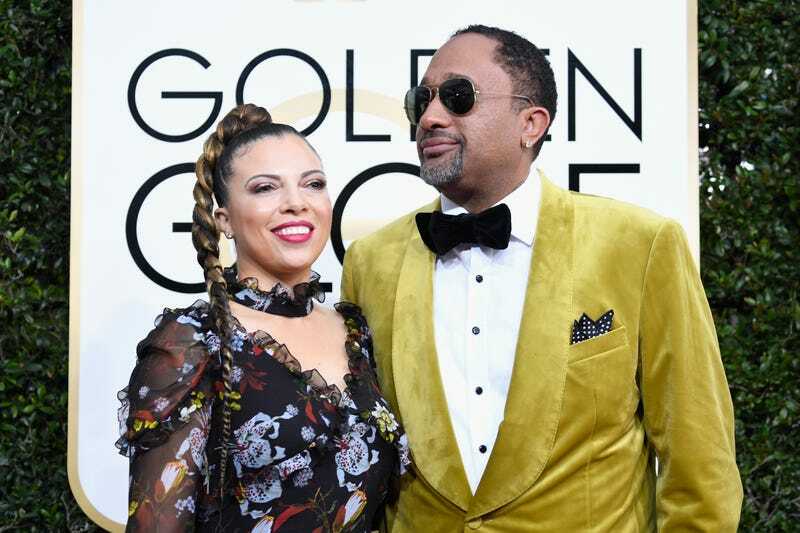 Producer Kenya Barris (R) and Dr. Rainbow Edwards-Barris attend the 74th Annual Golden Globe Awards at The Beverly Hilton Hotel on January 8, 2017 in Beverly Hills, California. In a new cover story for The Hollywood Reporter, Barris breaks his silence speaks on everything from the shelved episode of black-ish to Roseanne to his plans to create “unapologetic content” with his new Netflix deal. The cup of tea is so full, we will do you the favor of breaking it up into bits so that it is more easily digested. So what really happened with that episode of black-ish? The “Please, Baby, Please” episode of black-ish was going to depict Dre, as portrayed by actor Anthony Anderson, telling his baby son Devante a story about all the events that had happened during his first year of birth. The topics to covered included Donald Trump, the Charlottesville hate rally and NFL players kneeling. Days before the episode was supposed to air, it was shelved indefinitely by the network, and Barris told THR that was the last straw for him in what had already become a complicated relationship between The Walt Disney Co. and himself. There’d been a flurry of back-and-forths with executives as high up as CEO Bob Iger, who called Barris from home, sick with laryngitis, and, per two sources, had a reasoned conversation with the showrunner about the political sensitivities of being a broadcast network in 2018. Executives at ABC, more than any other network, have been forthright about their desire for more red-state programming since Trump’s win — and with Barris’ latest episode, they feared they’d be alienating the very population they’d tried so hard to court. That Disney brass wouldn’t want to poke Trump himself just as the company was seeking Justice Department approval of its acquisition of most of 21st Century Fox is widely believed to have been a factor as well. Ultimately, Barris said his decision to leave ABC wasn’t just about the shelved episode, but also the limitations of network TV. At one point black-ish got scheduled to follow the Roseanne reboot in the television lineup. Barris told THR that if the show had not subsequently gotten canceled, he was prepared to speak out against it. When word got out that Barris was on the market and available, Warner Bros. threw their hat in the ring to try and woo him, but he ultimately decided to go with Netflix because of his bigger vision. Barris said watching Grey’s Anatomy creator Shonda Rhimes get out of her ABC contract and make the leap over to Netflix inspired him to make the jump. Ultimately, Barris is very clear on what his goal is as he begins his new partnership with Netflix.